“Hell, there are no rules here – We’re trying to accomplish something.” Zach Braff (Scrubs, Garden State) quotes Edison on the Kickstarter profile for Wish I Was Here, a personal film that he’s looking to finance through this platform. And indeed, rules aren’t set in stone, especially in this third wave, web 2.0 world we live in. However, people on both sides of the coin have interesting things to say in regards to this method of funding that is rising in popularity the way Instagram and cat videos are. Braff’s film, which he’ll be directing, starring in, and co-wrote with his brother, is a follow-up to his critically acclaimed directorial debut, Garden State, which came out almost nine years ago. The art film, which is very personal to him, is about a struggling actor in his thirties who ends up having to home school his two children. After attempting to finance both through the studio and independent system, he was inspired by the success of Veronica Mars. For those of you who live in a cave, Veronica Mars raised $5.7 million of the $2 million it set as a goal in order to finance a film version of the CW show. The Kickstarter project was launched two days ago. It seeks a generous $2 million and as of now (April 26, 14:52 EST), it has reached $1.8 million with over 25,000 backers. I wish my little project for Vicissitude, which I launched almost two years ago, had reached that unimaginable amount of money, which takes me to my next point. Some people are all for it and others have determined points of view. The fans love it. They get to be a part of the project and get rewarded with cool perks depending on the amount of money they donate. Hey, I’m in if Steven Levitan and Christopher Lloyd launch a campaign for Modern Family. Also, it opens new doors for niche or art films to be funded. On the other hand, some people think that bigger, well-established filmmakers, such as Braff, shouldn’t be taking advantage of this method. Tim Anderson is an Orlando-based filmmaker and runs the monthly Film Slam festival at the Enzian theater. Anderson believes that people who are helping finance films this way are ignorant. Not only are they paying them to make them money, but they’ll pay them again when they go see it at the movies, rent it, or buy it. “Take your $25 dollars and give it to a homeless person, or a charity for battered women, or someone in your community that is trying to make art for a living. 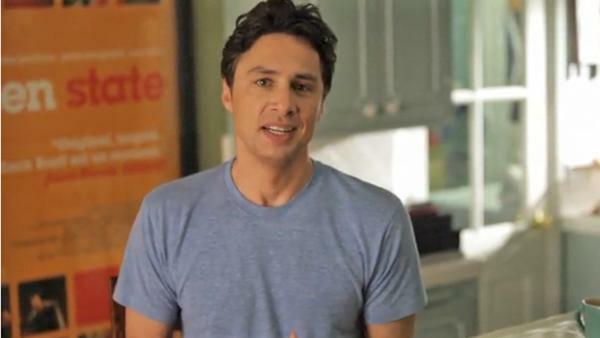 Don't give it to Zach Braff whose residual checks each month for Scrubs are worth more than your house,” he stated last night. Personally, it’s up to you to do what you want with your money. Going back to Edison’s quote, “there are no rules.” However, I believe that Kickstarter and other campaign websites such as Indiegogo are meant for filmmakers, artists, and creators who seriously lack capital, to seek contributions. I completely understand that as a fan, it’s thrilling to know your name has the potential of appearing at the end credits or that you’ll receive exclusive goodies (Hey, I admitted I would donate if Modern Family were to go down the same path), but there are hundreds of projects out there by aspiring artists that deserve a shot. About 59% of Kickstarter projects fail to get funded. It will be interesting to see if this will truly be the future of film financing for big budget projects, or if it’s just a phase that will have it’s fifteen minutes of fame. We shall see. Solid commentary, I'm with you Ricky! It's detrimental to the democratization of media for people who have enough privilege and platform to be heard, to be taking advantage of "the little guy's" tools. These are platforms to help bootstrap artists and projects to get their stuff made, but I see the incentives to give to big productions. Also, I love that you talked with The Enzian about it. Thanks Emily! I think we're on the same page here. Like I said, it will be interesting to see if other "well-established" filmmakers will follow this route. And yes, there are struggling artists with great talents and ideas who are being cornered.